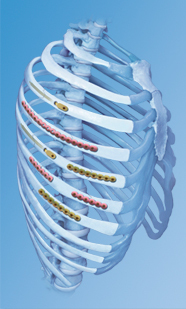 Broken ribs can heal quickly and typically do not require fixation. However, multiple segmental rib fractures in the form of a flail chest can compromise lung function and are associated with an increased mortality rate. Fixation of serial rib fractures with plates can decrease the associated mortality . We completed a comprehensive study to determine the average geometry of human ribs . Based on these findings, we developed a surgical chest wall fixation system [3,4,5]. This system combines the advantages of soft tissue-sparing intramedullary fixation and anatomically pre-contoured plating. Advancing a technique first employed in the 1970s , this two-pronged solution provides the surgeon with the maximum flexibility for time-efficient restoration of chest-wall integrity. This system has become commercially available and has been used in over 1,000 patients. Pelvic ring fractures can lead to life-threatening internal blood loss. Early stabilization of the broken pelvis can effectively control internal bleeding. We conducted laboratory research to determine optimal parameters, efficacy and safety of non-invasive stabilization with an external pelvic sling [1,2]. Based on results of this study, we developed a pelvic sling, which allows for optimal application of pelvic stabilization at the accident scene. In a prospective multi-center clinical trail, conducted at Legacy and OHSU, the performance of the pelvic sling has been documented . After obtaining patents, the pelvic sling has been successfully licensed to the Seaberg Corporation. Today, this “SAM SLING” is being distributed in 46 countries and over 100,000 units have been sold. U.S. Patents No. 6,554,784 and 7,008,389. Mechano-active stimulation in vitro replaces loading conditions that are responsible for tissue differentiation and maintenance in vivo. MATE promotes the course of nature by replicating mechano-stimulation in the form of dynamic compression in a standard six-well configuration. 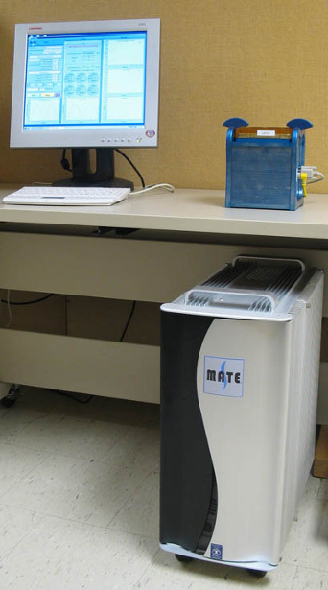 In addition, the MATE system automatically measures the development of culture mechanical properties. These proprieties describe the maturation of scaffolds for functional tissue engineering. Consequently, MATE is the first system that integrates Mechano-active stimulation and material property assessment in a standard six-well configuration . 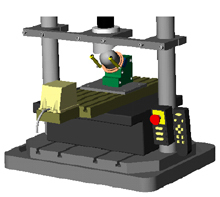 It is a practical, simple, and precise solution for simultaneous mechano-stimulation and material property evaluation. Traumatic brain injury (TBI) is an acquired neurological disorder that can cause long-lasting disability with limited treatment options. Therefore preventative strategies must be emphasized in high-risk activities to reduce the individual and societal burden of this pervasive injury. Bicycle activities account for 20% of all sports-related TBI, with 42,000 annual injuries in the U.S. In an effort to alleviate the incidence and severity of these head injuries, helmet usage is now customary, and in some States mandatory. However, contemporary bicycle helmets are not designed to mitigate rotational head acceleration, which is a clear physical mechanism of TBI. We are developing a novel helmet using Angular Impact Mitigation (AIM) technology that integrates recent advances in material science to provide superior energy absorption in a lightweight and cost-effective design. 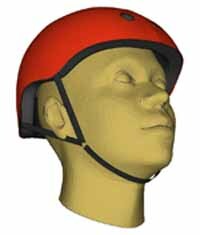 A key innovation of the AIM helmet is that its structural properties behave similar to a torsional spring and damper, and thus enable the AIM helmet to attenuate severe angular head accelerations. The specific aim of this line of research is to determine whether AIM technology can significantly reduce the risk of TBI compared to standard helmets. 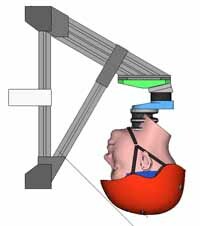 Mechanical testing of AIM helmets and standard helmets will be performed with an oblique helmet testing rig that can measure linear and angular acceleration during vertical and oblique impacts. The resulting kinematic data will be input into an established computational model that predicts the risk of TBI. Florian Feist spent five years modeling and designing impact mitigating structures for the automotive industry, and this experience should expedite the design process of the HIVE helmet. Florian Feist has experience in impact simulations using FE-codes and MB-codes (Madymo, LS-Dyna, PAM-Crash, Radioss), which will assist with the problems that tend to develop when running finite element models. Locked plates are revolutionizing plate fixation of bone fractures. We developed an osteoporotic diaphyseal bone model to evaluate locked plate performance in distinct loading modes . 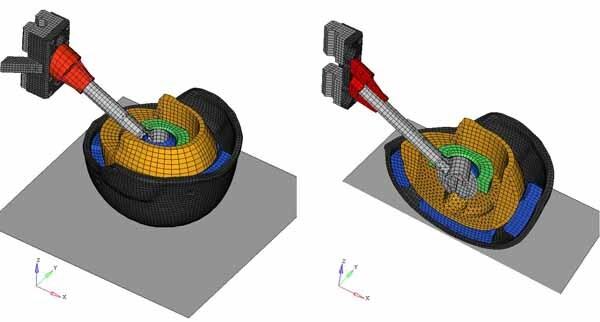 For evaluation of lag screw migration and cut-out failure, we developed a pertrochanteric fracture model [2,3]. This model simulates for the first time bi-axial rocking motion and gate-cycle loading of the hip. In addition to the number of load cycles to cut-out failure, it acquires the complete 3-dimensional migration history of lag screws. Time and cost efficient simulation in surrogate bone specimens has been validated on cadaveric specimens. Articular and meniscal cartilage are highly functional components of human joints, providing for load distribution, dampening and low joint friction. Their mechanical structure and function can be uniquely characterized by observing the strain distribution in response to cartilage loading. 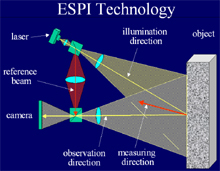 To overcome the inherent difficulty of measuring strain on cartilage, we employ a state-of-the-art laser-based technology (quantitative Electronic Speckle Pattern Interferometry: qESPI), capable of acquiring full-field strain in a non-contact manner. Using qESPI, we determined the non-linear strain distribution and strain relaxation behavior of articular cartilage from the patello-femoral joint . This research has received the 2003 Microstrain Award of the American Society of Biomechanics.